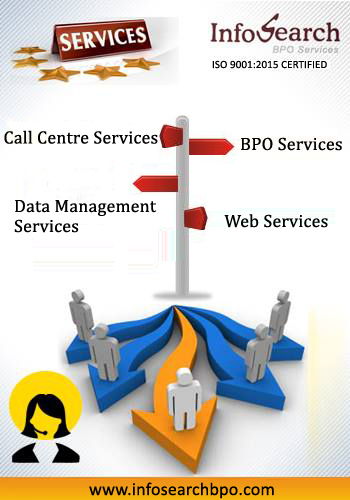 Infosearch BPO is an Outsourcing company specializing in Call Centre & Inbound BPO & Data Services. Infosearch is celebrating its successful 12th year in the Outsourcing business. We serve International businesses especially having huge work experience & loyal clintele in UK, Australia, USA & India. Contact enquiries @ infosearchbpo.com right away for your business outsourcing projects. Infosearch can answer the calls from your customers, do customer service, provide technical support for your products, can simplify customer service with IVR, do inbound selling of your products and more. We handle these services through our Inbound & Outbound Call Centre. Infosearch handles all your back office services including invoice factoring, underwriting, accounts & finance, HR, e-com support & infrastructure management through our BPO division. You can outsource all types of data services to us including Data Processing, Mining, Cleansing, Verification & Extraction and Conversion and we do it with minimal error & maximum accuracy. In the industry since 2005. Have seen success & growth ever since. World class infrastructure to support every unique process. We carry out variety of processes & services, customized for every business. We have international clients, as we support Global businesses. Well trained & experienced call centre executives. Client retention & their satisfaction is our motto.